For centuries Krakow has been a cultural, academic and political centre of Poland. Although it is no longer the capital of Poland, Krakow remains the most important Polish city after Warsaw. Krakow’s Historic Centre was among the first sites chosen for the UNESCO’s original World Heritage List. Having escaped destruction during the World War II, the old town retains its original shape and charming atmosphere, being the most beautiful old district in Poland today. The heart of the old town is the Main Market Square, which is the largest in whole Europe. 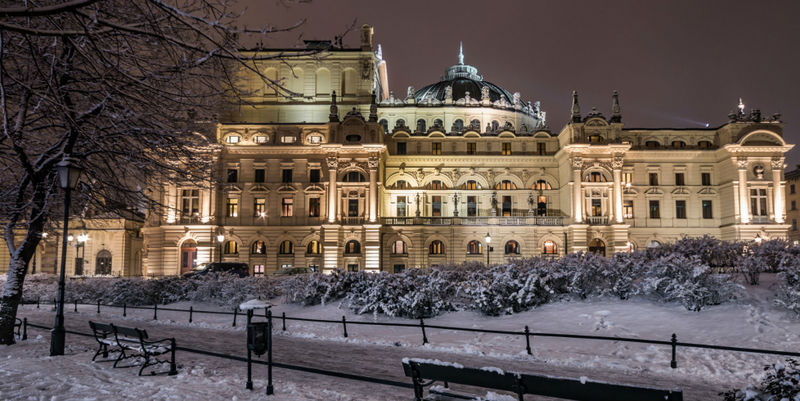 At the centre of the square, surrounded by tenement houses and noble residences, stands the Renaissance Cloth Hall (Sukiennice), currently housing gift shops, restaurants, merchant stalls and the National Gallery of Art upstairs. However, the main landmark is St. Mary’s Basilica: a brick gothic church re-built in the 14th century, characteristic for its two impressive towers. 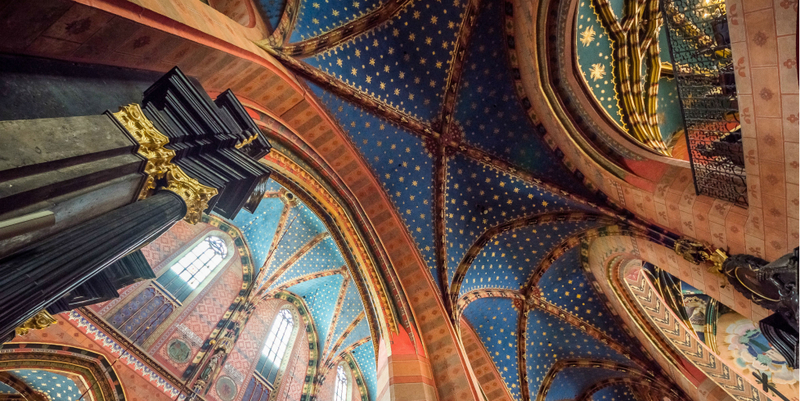 The church is famous for remarkable frescoes by Jan Matejko, stained glass windows by Stanisław Wyspiański and Józef Mehoffer, and most of all for the main altar carved by Wit Stwosz. From the top of the basilica’s taller tower a trumpet signal, called Hejnał Mariacki, is played every full hour. It’s melody breaks off suddenly to commemorate the legendary 13th century trumpeter, who was shot in the throat while sounding the alarm before the Mongol attack on the city. The noon-time Hejnał is transmitted live by the Polish Radio all over Poland, so it’s melody is familiar to every Polish ear and immediately associated with Krakow. Few step away from the Main Square you can find the Collegium Maius. The building, dating back to the 14th century, is the oldest part of the Jagiellonian University – established in 1364 as one of the first universities in Europe. The Jagiellonian University remains to be one of the best universities in Poland. Along with several other universities and academies based in Krakow it attracts over two hundred thousand each year giving Krakow the well-earned name of the students’ city. 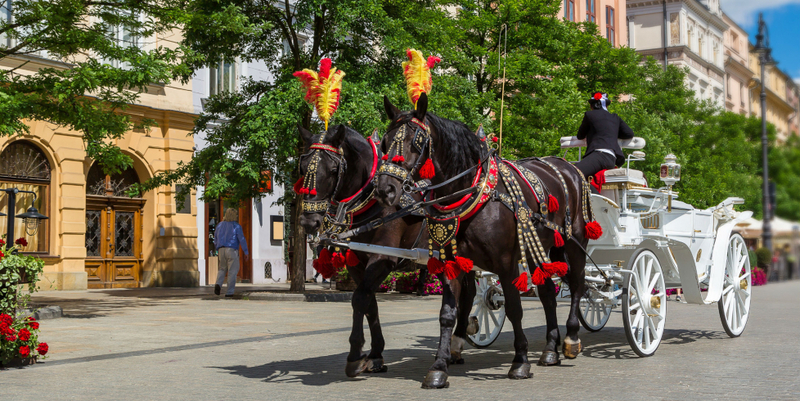 The Royal Road – the coronation route once traversed by the Kings of Poland – will lead you along the Grodzka St. to the Wawel Hill crowned by the Royal Castle and the Cathedral. Wawel is a symbolic place for Polish state and history. For six centuries the castle was the residence of Polish royalty. The Wawel Cathedral was the coronation site of nearly all Polish kings, as well as their final resting place even after the capital was moved from Krakow to Warsaw. Also the greatest Polish notables were honoured by the burial in the cathedral crypts. The Sigismund Bell – largest of the five bells in the Cathedral’s tower – is considered to be one of the national symbols and tolls only on special occasions.